While Extension personnel in NC have learned a great deal about managing soybeans over the last few years through check-off supported projects, many of our farmers are not aware of all that has been learned. Mini-projects will be carried out by county Extension agents to showcase results of soybean check-off funded projects. These projects will enhance the visibility of results of NCSPA funded research and help educate growers at the local level. In recent years we have seen an increase in acres devoted to early maturing soybeans. Growers need to know if standard production used for later maturing varieties are adequate to maximize the yield of these earlier varieties. This project will evaluate starter fertilizers, seed treatments, foliar applied fertilizers, and fungicides on maturity group III and IV soybeans. Results will provide growers with best management practices for early planted, early maturing soybeans in Eastern NC. There are several foliar products on the market for which there is little or no reliable local data on the efficacy of these products. Tests will be conducted to evaluate these products at on-farm sites across NC. Regardless of the results, producers stand to gain knowledge by knowing what yield changes, if any, are produced by which products, and at what cost. Soybean profits are a function of yield, price, and cost of production. Growers are limited on how much influence they can have on price and most growers have already done most of what they can do to limit the cost of production. That means yield is the one component of profit that has the greatest potential for growers to alter. On-farm tests will be established in several counties that include a plot that comes close to maximizing yield as possible. The maximum yield plot will have all treatments and then other plots will be the subtraction of one treatment to determine how much yield is lowered if that treatment is not used. Results will help producers determine what production components are appropriate to maximize soybean yields in a dry-land environment and help them improve farm-level profitability. There are several non-foliar products on the market for which there is little or no reliable local data on the efficacy of these products. Tests will be conducted to evaluate these products at on-farm sites across NC. Regardless of the results, producers stand to gain knowledge by knowing what yield changes, if any, are produced by which products, and at what cost. In recent years we have seen an increase in acres devoted to early maturing soybeans. Growers need to know if standard production used for later maturing varieties are adequate to maximize the yield of these earlier varieties. This project will evaluate plant populations, planting date, row spacing, and nutrient applications on maturity group III and IV soybeans. Tissue sampling will also be carried out to begin to develop an uptake curve for MG 3-4 soybeans. Results from this work will provide growers with best management practices for early planted, early maturing soybeans in Eastern NC. A wide range of planting dates and varieties are used by North Carolina soybean farmers. Most data shows that earlier planting dates result in higher yields, but how early should growers be planting and what maturity groups should they use. The goal of this project is to investigate the interaction between planting date and maturity group. Uniformity of seedling emergence has been shown to be important to corn yields but is it also important for soybeans? Tests will be carried out to flag plants as they emerge and measure the yield of these plants that emerge on different days to determine if uniformity of emergence is important. These results will help growers make decisions about investments in new planting equipment. The winter nursery in Puerto Rico has been used by the USDA/NCSU breeding program to advance breeding lines through one or two generations of inbreeding in the off-season for over 30 years. This speeds up the total time required to generate a new cultivar by 2 to 3 years. Funding is for managing and growing plants at the USDA winter nursery for breeding program material. Use of the winter nursery for the USDA breeding program helps permit timely release of new varieties and germplasm. The last few growing seasons have been exceptionally wet for much of NC and excess rain can curtail crop performance. Flooding per se is not common in NC, but we do suffer from excess water in the form of wet roots, where oxygen supply is reduced and toxic respired CO2 builds up in the soil. Chronic wet roots can cause slow growth, poor leaf color, and spindly plants, often limiting yield. Breeders in the Mississippi Delta have been screening for flood tolerance for many years and some of those varieties did well in NC in 2013. These Mississippi Delta lines will be evaluated in NC under normal and chronically wet conditions. Funding will be used for a Master’s student to carry out this work. Results from this work will be used to initiate a breeding program to select new soybean types that perform well under flooding conditions in NC. Soybean variety selection can be overwhelming for growers. Seeing potential varieties side by side in a local environment can help growers make decisions about which varieties to use. Funding will provide county Extension personnel support for local variety demonstrations. Seed from 20 to 30 of the most promising soybean varieties (conventional, RR, LL) will be made available to Extension agents for them to plant at an on-farm site. This will allow growers in that area to evaluate promising varieties. These sites can be used in a county Extension field day to discuss the varieties. Herbicide carryover is the unintended persistence of an herbicide in the soil from one crop to the next and can occur in double-cropped or full-season system where soybeans follow a cereal such as wheat or corn. The level of herbicide carryover and crop responses are governed by soil and environmental properties as well as plant genetics. While there have been studies demonstrating herbicide carryover in other regions of the US, there is a dearth of information available for the Southeast, in particular, for the highly variable soils in NC. The goal of this project is to generate information on herbicide carryover in soybeans to address this knowledge gap. This includes 1) determining the rate at which common broadleaf herbicides (ALS, HPPD, & PSII) break down in various soil types across NC, 2) determining the residual herbicide levels at which the growth of soybean plants are affected by evaluation in a greenhouse setting, and 3) determining if different varieties are affected by these residual herbicides differently. Funding will be used to support a graduate student who will be conducting this work. Results of this work will be provided to growers to help them make decisions about herbicide selection and application. Currently, glyphosate & ALS resistant Palmer is controlled with glufosinate but suspected glufosinate resistant Palmer has been identified in NC. This could be detrimental to the soybean industry. To prevent the spread of this resistance, we must monitor populations across the state. A bioassay to detect glufosinate injury on plants will be developed that will help detect resistance quickly. A monitoring strategy for glufosinate resistance across the state will also be developed. This work will help NC soybean growers avoid the establishment & spread of glufosinate-resistant Palmer populations. Both soybean cyst nematode (SCN) and root-knot nematode (RKN) cause damages to NC soybeans. In 2015 it was estimated that 2 million bushels (about 3%) were lost to these two pests. Both RKN and SCN are capable of surviving in the soil for long periods of time which makes control difficult. Four different species of RKN and 16 different races of SNC affect soybeans, causing resistant variety selection and crop rotations with non-host crops challenging. Recently, several seed treatments for nematode control have been made available to producers but limited information is available to NC growers on the efficacy of these products. Three treatments will be evaluated – fluopyram, Pasteuria nishizawae, and Bacillus firmus – as both a seed treatment and a soil drench treatment. This work will be carried out in three different fields (one in each region) naturally infested with damaging nematode populations. Nematode populations will be assessed before and after treatments are applied. Plant health and weather will also be tracked. Results from these evaluations will be used to update nematode management recommendations and ultimately may provide growers with another tool for combating nematodes. Frogeye leaf spot (FLS) is a fungus caused by Cercospora sojina that can affect the leaves, seed, pods, and stems of soybeans. It is estimated in 2014 FLS reduced yields in NC by 560,000 bushels (approximately 1%) and in susceptible cultivars yields may be reduced by as much as 30%. The best control is achieved with fungicide mixes containing strobilurins (Qol’s – group 11) and triazoles/imidiazoles (DMI’s – group 3). Resistance to strobilurin fungicides has been confirmed in several states, including NC, yet the extent of fungicide-resistant populations of C. sojina has not assessed in our state. Establishing relationships between region and fungicide resistance would allow for targeted management strategies and help limit control failures. This will be carried out by collecting samples from fields across various regions of the state naturally infested with C. sojina. C. sojina colonies from these leaves will be assessed to determine if fungicide resistance is present for group 11, group 3, and group 1 fungicides. The EC50 values (value whereby 50% of the isolates were inhibited) for each fungicide will also be determined. Funding will be used to support a technician to carry out this work during year 1 and to support a Master’s student during year 2 and 3. Results from this work will be used to generate recommendations on fungicide selection practices for FLS management and to generate a map of regional fungicide resistant C. sojina incidence over 3 years. 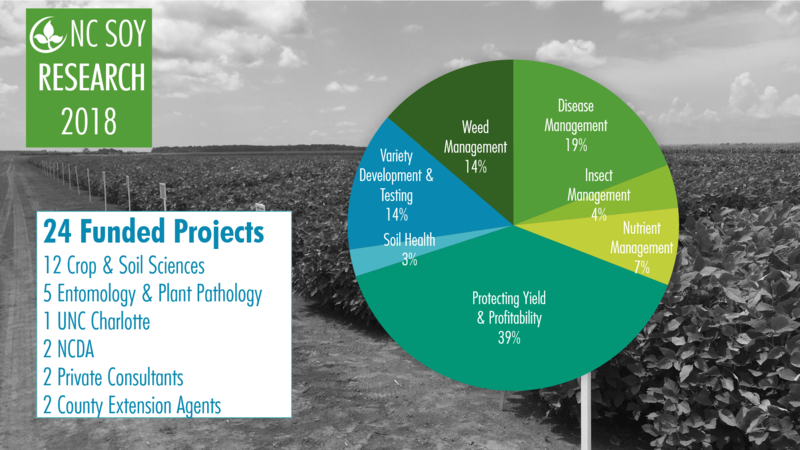 SCN is one of the most yield impacting pestis for NC soybeans. One of the most cost effective ways to combat SCN is through resistant varieties but the usefulness of resistant varieties is unclear due to lack of knowledge of SCN races present in NC. Soil samples from SCN infested fields across NC will be collected and assays run to determine which races are most prevalent in different part of the state. Results from this work will help growers determine which control practices are necessary for successful management of SCN. A new RKN species has been identified in 4 NC counties. This nematode is significantly more aggressive than other RKN species and regenerates quickly even with fumigation. It has a wide host range and most crops grown in Eastern NC are susceptible. Soybean lines will be inoculated with M. enterolobii in the greenhouse and these lines will be assessed for tolerance to the disease. Results from this work will help researchers identify if there are any resistant varieties available as well as assess potential mechanisms of resistance for future work. SCN race 2 is the predominant race in NC soybean fields (based on limited sampling) but few soybean cultivars are available that have race 2 resistance. An experiment will be conducted to screen 300 wild soybean accessions and 50 commercial varieties for resistance to SCN race 2. This work will allow researchers to begin to identify current soybean varieties that have resistance to race 2 and work to develop new, diverse SCN race 2 resistant cultivars. Problem diagnosis is an important tool that cooperative extension agents use in advising producers to select appropriate corrective management approaches. The NCDA plant tissue lab and the NCSU Plant Disease & Insect Clinic are fee-based services. Funding will provide county extension agents with 100 plant tissue samples at the NCDA and 45 plant insect and disease clinic samples at the PDIC. Caterpillar pests are the most damaging insect pest to NC soybeans yet management of these pests is threatened due to increasing insecticide resistance. Work will be conducted to develop a quick way to assess pyrethroid resistance, understand if pyrethroid resistance in corn earworm is associated with cropping patterns, investigate corn earworm resistance to Intrepid Edge, and to begin to understand insecticide resistance in soybean looper. Results will help researchers understand insecticide resistance in caterpillar pests in NC and provide growers with recommendations about insecticide choices for 2019 and beyond. Potassium (K) deficiency is the most prominent nutrient deficiency in plant tissue samples analyzed by NCDA and 40% of soil samples submitted by the NCDA are medium to very low for K (K-1 = 0-50). If recommendations are followed, K fertilizer costs can be a significant part of growers’ annual operating expenses (19%). However, if under-applied and K is limiting, seed yields are decreased from 5-20%. Two decades have passed since soybean K needs were researched in NC. Since this time, yield potential is greater and practices have changed. There is a need to evaluate current soil test K recommendations and plant tissue testing sufficiency ranges to assure NC growers are receiving the best information for economic production and competitive yields. Sites of varying K levels will be selected under conventional and no-till production systems to evaluate applications of muriate of potash (MOP) ranging from 0 to 200 lbs per acre. Tissue sampling will also be done at V5 and later to help determine optimized rates of K for NC. Results from this project will be used to update the NCDA soil and plant tissue recommendations and help growers optimize their fertilizer applications. Seed composition of soybeans is becoming a focus for marketing, but seed composition changes under environmental stress. In order to meet the needs of our end users, soybean growers must understand how drought will change plant nitrogen metabolism. In this project, high and low protein genotypes will be tested with and without irrigation. Seed, leaf N, and yield will be measured. This work will help researchers begin to understand the relationship between drought, yield, and protein. It will also help improve breeding efficiency for drought and seed composition. Cover crops may be beneficial in increasing soil health by increasing organic matter and nutrient cycling by biological processes. Regional variation in soil properties and local climates may affect the impacts of using cover crops. The benefit of introducing cover crops into a long-term corn-soybean rotation will be evaluated on a Casville sandy loam under 9 different tillage treatments. Soil properties and crop yields will be compared. Results should lead to recommendations for growers on cover crop use in a corn-soybean rotation.